The Skinny: A standard action-thriller that's sometimes silly but overall entertaining. While an impossible candidate for classic status, Explosive City proves to be an engaging enough cop action potboiler. Handsome Alex Fong goes ultra-intense in the surprisingly decent cop thriller Explosive City. When a government officer (Joe Cheung) visits Hong Kong, he gets targeted for assassination by Jade (Hisako Shirata), a mysterious female killer who subsequently gets into an accident and loses her memory. The officer in charge, Cheung (Simon Yam), assigns CID Yiu Tin-Ming (Alex Fong) to investigate her case, but before he can even start, it's already too late. Ming's wife and child get taken hostage, and he's forced on the run with the still amnesiac Jade. Meanwhile, the nefarious Japanese bad guy (Sonny Chiba) makes his presence known by speaking in a guttural tone, quoting Sun Tzu's "Art of War", and wearing a newsboy cap like it's required gangster chic. Ming must unearth Jade's memories to discover her connection to the baddies, lest further lives be lost and the movie stretch to two hours. All this plus many shots of Simon Yam brooding. At first glance, Explosive City looks to be cheap, crappy action stuff not unlike director Sam Leung's previous Color of Pain. 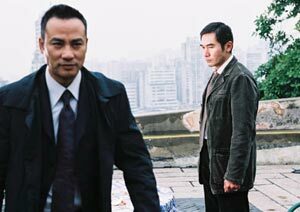 However, instead of that film's questionable leading duo of Raymond Wong Ho-Yin and Kenya Sawada, we get Simon Yam and Alex Fong. If the implication isn't there, then here it is literally: Simon Yam and Alex Fong are much better actors than either Raymond Wong or Kenya Sawada, and both take this typical genre plot and make it much more watchable. Though Fong threatens to overact, he manages to play a convincingly harried cop whose disintegrating emotions prove compelling. Simon Yam is all calm, grizzled cool, and Hisako Shirata makes a competent femme fatale/amnesiac heroine. The rest of the cast ranges from effective (Sonny Chiba overacts, but what else is new?) to just plain bad (the bit players stink like mad). Plus, the inconsistent language only distracts. It's annoying when characters speak different languages while supposedly talking to one other. Why is it that Japanese-born Jade speaks Cantonese when talking to Ming, while everyone else speaks other languages to Sonny Chiba, and he only responds in Japanese? If one were to look at it logically, the implication could be everyone knows multiple languages, but nobody will meet anyone else halfway. However, there's no narrative decision presented, making the language mismatch distracting. There's simply no reason anymore for this sort of illogical storytelling; if the actor can't speak the language, dub them. Also, the majority of the actors who interact with Sonny Chiba are awful, so having them speak their own language is doubly annoying. Director Sam Leung drops the ball there.